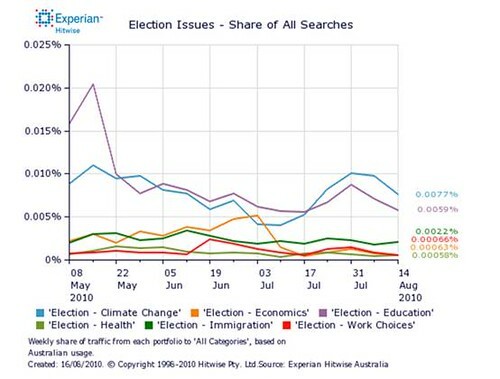 Climate change tops the bill as the #1 election issue for Australians online according to new research from Experian Hitwise but the major parties aren’t willing to address it because for Labor it’s easier to ignore the problem for the short term and the Liberals have a individualistic market forces driven approach which doesn’t like collective public interest projects. One reason it is so hard to slash carbon emissions is that climate change occurs globally. The countries that produce the most greenhouse gas all need to take action to fix the problem. That raises a classic economic dilemma called the tragedy of the commons. 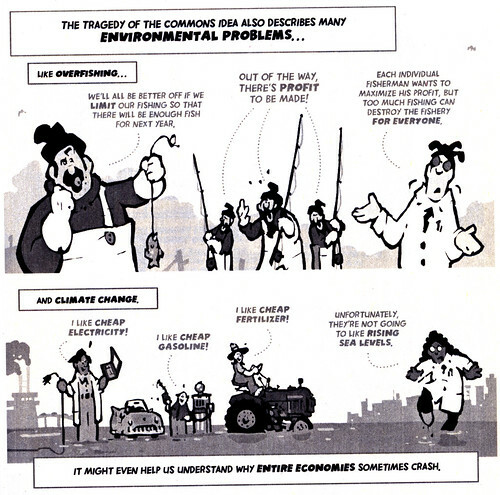 This tragedy of the commons idea was first popularised by Garrett Hardin who used an example of a situation in which multiple individuals, acting independently, and solely and rationally consulting their own self-interest, will ultimately deplete a shared limited resource even when it is clear that it is not in anyone’s long-term interest for this to happen. Climate change/Global warming is an example of tragedy of the commons because parts of the Earth like the air we breath and our oceans are shared resources which benefit everyone, but at present it’s “free” to damage them so because there’s no specific cost or tax for abusing them. For example the owners of a coal powered electric plant pumping pollution in the air or giant fishing fleets leading to fish extinction get to keep all the profits while the public as a whole suffers from the losses. Until there’s a financial cost on doing these kinds of activities like a Carbon Tax on polluters, the cost of things like coal powered electricity won’t reflect the true cost to society eg: breathing difficulties from coal pollution and rising sea levels due to increased amounts of CO2 in the atmosphere.